French shipyard Piriou has unveiled a 95m yacht concept, the Navire de Voyage (Travel Ship) 95. Find out more about this superyacht. Following on from their very first explorer superyacht, the 77m Yersin, French shipyard Piriou has recently unveiled an even bigger yacht concept, offering the level of comfort and safety you would expect from the company. At 95 metres, the Navire de Voyage (Travel Ship) 95 has been designed to meet strict environmental standards, all the while providing a luxurious ‘off-road’ platform. The superyacht is designed to cruise the high seas in all weathers. Designed and built according to Bureau Veritas’s stringent ‘Passenger Vessel’ standard, the yacht will be able to accommodate 16 guests and be served by 31 staff. 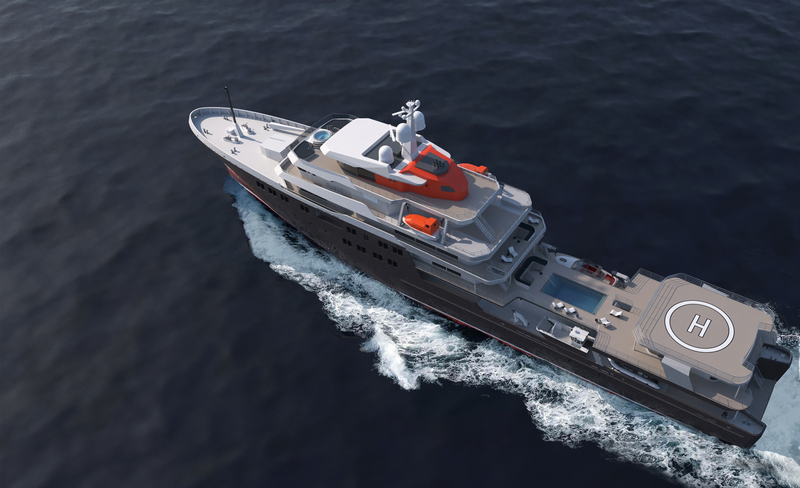 As with Yersin, the yacht will have a cleanship rating, focusing on as little impact on the environment as possible by utilising advanced emission-reducing and biological treatment features. She is designed to be able to reach 7000 nautical miles while cruising at 12 knots, with a max speed of 18 knots. Outside she features generous deck spaces for stowing of her four tenders, as well as a helipad suited to receive a EC135 or EC155 helicopter. The Navire de Voyage 95 comes complete with an outdoor swimming pool and cinema.